Today we met with Adam from AGTree, a local tree trimming business here in Kirkland, about cleaning up some of our yard’s trees. EXCITING! I know, right? I took some convincing, too. I don’t spend a lot of time with trees on my property. I don’t even look at them half the time I’m coming and going. Plus, doesn’t trimming reduce shade? And, well, I WANT shade! But there is one thing worth getting excited about: NOT HAVING A TREE FALL ON YOUR HOUSE! 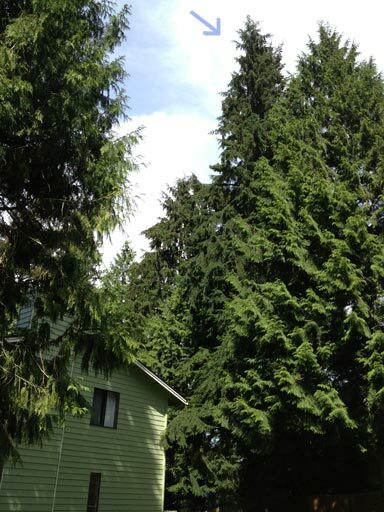 This is a genuine concern, especially here in the PNW when the trees are friggin’ huge, like twice+ the height of the house. When one of those falls down, it’s not going to be nice. Other benefits: less tree debris on the ground to pick up before mowing, no bridge for critters to use to get onto your roof (and mess it up), and general Pride of Ownership™ feelings. 3) Trimming the branches that are crowding our backyard. 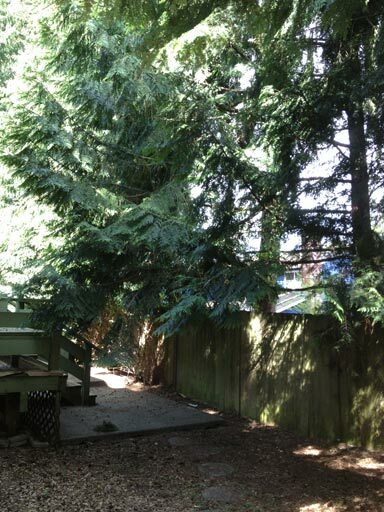 I emphasized that these trees actually give us privacy from the tenants who occupy the house on the other side of the fence, so we don’t want to lose that coverage. But we do want less of a barrier to walking through our yard. 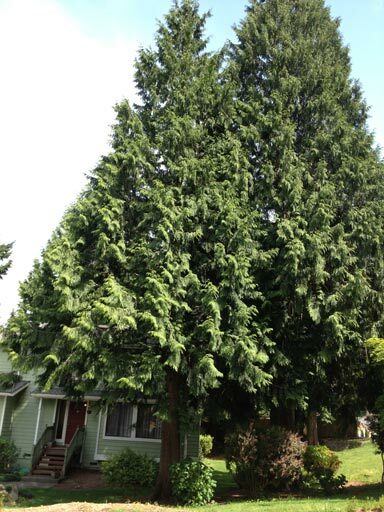 4) Removing this ridiculously tall and awesome hemlock which, sadly, has a long vertical split going up most of its trunk. 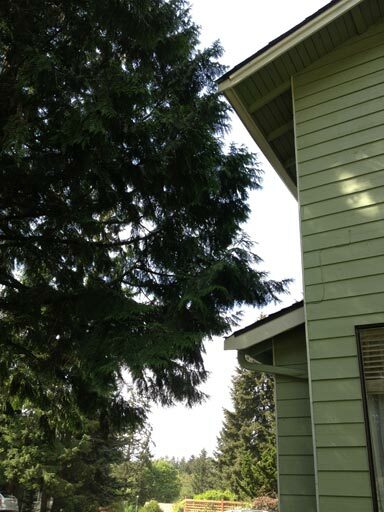 I’m always sad when we have to remove a tree, but I’ll be more sad if it splits and falls on the house.